Networking is a must in the music industry, even if you hate the idea of networking. Now, here's the good news. Networking need not be painful, cheesy, uncomfortable, cringe-worthy, or anything else you are imaging. Start out by looking at it this way: networking doesn't have to be anything more than meeting your fellow music lovers and brainstorming about how you can work together to get great music out there — nothing more, nothing less. With that idea in mind, these tips will help you feel better about music industry networking. There are tons of music industry networking opportunities: from music industry trade shows to local musician meet-ups. If you're not especially comfortable networking or don't have a lot of experience doing it, then start small. Instead of jumping into the conference hall at Midem right off the bat, start out visiting a local event and meeting people there. The more you get used to mixing in a room of strangers and talking about your own projects, the easier it will get. You can use that confidence you build in those smaller events to move up to larger events. Confidence is key when you are networking, and doing a little homework before any event will help you feel ready to conquer the room. When possible, do some research into who will be attending an event (for instance, before a trade show, check out the attendee database). If there are some people you know you want to make a connection with, find out what you can about their business and current projects, so you sound knowledgeable when you're talking with them. Knowing a little something about them will also give some conversation starters. Know your spiel. You don't want to go into conversations sounding like you're reading from a script, but devote a little pre-event time to thinking about how you will describe your work in a clear and concise manner. This rehearsal time is especially important if you are pitching things or looking for business partners while networking, as opposed to simply making connections that might come in handy down the road. When you get your big chance to sit down with, say, the label you want to license your new album, and they ask you what you're working on, you don't want to be unprepared or unsure of what to say. No, it is much better to be prepared to say, "We've just finished recording an album of Joy Division covers done in a flamenco-inspired style." Making network connections isn't like what happens at the end of the night at a bar or club. You don't want to ask people to plug their numbers into your phone or jot numbers down on your hands. Get some business cards made up with your name, company name (if applicable), email address, and contact number and get ready to hand them out to the new people you meet. If you are promoting something tangible, come prepared with promotional material, if possible—a label sampler, a promo of your band, some samples of your cover art—whatever is relevant. That said, you don't want to invest huge amounts of money into this promotional material. Especially at large events, people tend to collect this stuff and then realize when they get home that they are never going to listen to it. But it is still worth it to come prepared, so you are at least in the position to put something in the hands of a potential new business partner. You never really know when that one important person is going to hear or see your stuff and become incredibly valuable to your career. You're good enough; you're smart enough, and doggone it, people like you. But how do you talk to people? Bottom line: be yourself. You'll see all kind of behavior at networking events, from people who seem to be walking around going, "I'm networking! I'm networking! Wanna network with me?" to people just quietly chatting with a few folks. If you've prepared, feel confident that you've got everything you need to make new business connections and just go for it. Remember that the point of networking is to build mutually beneficial relationships, so no one is doing you a favor by talking to you and finding out about your work. You're either going to work together, in which case you'll be helping each other, or it's not going to be the right fit. There's nothing wrong with either outcome and not making a viable business connection doesn't mean you have done anything wrong. The most important part of networking happens the next day. Follow up with your new contacts, even if it is just to say, "enjoyed chatting—keep in touch." Don't fake it - Don't know about some musician someone is talking about? Don't understand some music industry term used? Admitting you don't know is far less embarrassing than faking it and being wrong. Everyone has to learn the ropes. There's absolutely zero shame in that. Embrace every learning opportunity. If you are constantly pretending you know, then you will never learn. Picking up new knowledge is positive. Relax - You're not doing it wrong. Some people love business terms, so they talk about "networking." Nothing wrong with that, but if the idea of formal networking makes you break out in hives, remember—networking is just a fancy word for talking to people who work in the same business as you. Don't create a lot of pressure for yourself. Being quietly confident and knowledgeable is just as "impressive" as being Mr./Ms. Schmoozey Pants. Do your homework, be yourself, and you'll be just fine. Work the room - Resist the urge to sit in the corner chugging your beverage of choice with a friendly face. Make the rounds and meet new people. If you are new to this kind of event and a little hesitant to strike up a conversation, set yourself a goal to meet three new people and call it a day. You can work your way up to more as your comfort level increases. Provide advance notice - Especially for large events, if someone is attending that you know for sure you want to meet, it never hurts to drop them an email just to say hello and that you look forward to meeting them. Be open-minded - You never know who is going to make a big difference in your music career—and you never know when they are going to help you, either. Every connection you make is valuable, even if the results are not immediate. 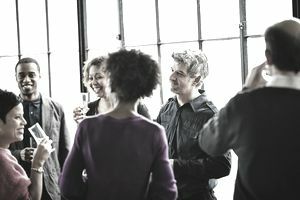 Even if you have a short list of people you want to meet at an event, welcome every conversation and connection. You just never know whether that kid you blew off is going to end up being the big shot agent who would be perfect for you five years down the line.